The Volkswagen Ameo is no secret. It was unveiled at the Auto Expo and we even had a brief experience with the car shortly after. Now though, we've driven the Ameo and as expected, there are no surprises. This is a premium, well designed and likeable car. I've said it before, India's silly sub-4m rule cannot spawn good looking cars. 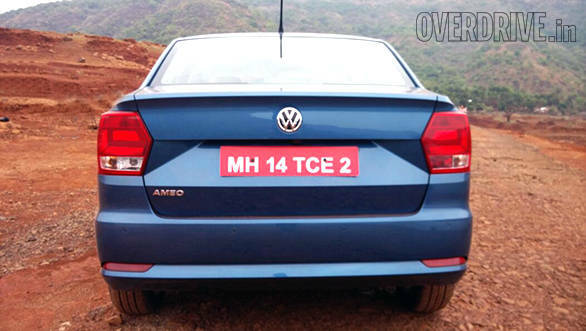 Working under such design restraints, Tilo Klumpp, senior designer Volkswagen AG, has done a good job with the Ameo. Let's start with the business end - the rear. The roofline has been dropped slightly so it flows better into the boot. Special attention was given to make sure the bootlid doesn't look too stubby and Tilo was allowed to salvage a tiny 35mm from the Polo's front to make the rear look more proportionate. The squared-off tail lamps look interesting and there are plenty of kinks and lines in the surface to prevent the boot from looking too boxy. The rest is pure Polo. It's almost impossible to tell that the front is a little shorter and aside from the new 'blister' kink on the front bumper corners there's precious little to distinguish the hatch from the sedan. Best looking car in the segment? I think it's a close call between the Ford Figo Aspire and the Volkswagen Ameo. The interior is a straight lift from the Polo. This comes with many positives and one negative. The dash is a combination of black and beige hard plastics and in the centre is the same classy console from the Polo. You get a touch screen audio system that also doubles up as a display for the reverse camera. There's also a central front armrest with an inbuilt stowage space. One of my favourite features from the Vento and Polo continue - one touch up and down windows with anti-pinch on all four doors. It doesn't sound like much but is actually a very convenient feature that few cars below Rs 15 lakh offer. The flat bottom steering wheel and instrument cluster are carried forward and behind the steering wheel you'll spot the cruise control stalk, another segment first. An auto dimming rear view mirror, rain sensing wipers, rear aircon vents, a folding rear seat and a cooled glovebox are a few more nice features. Overall, the dashboard feels the most premium in the segment and the feature list is rich. 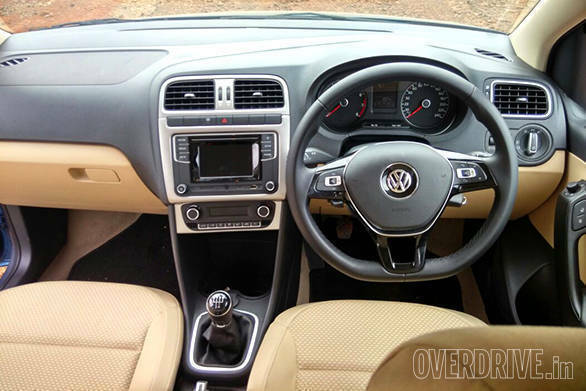 The downside however is that the Ameo sits on the Polo wheelbase which means rear knee room is compromised. With tall passengers up front, there isn't much usable space at the rear and the Ameo has one of the most cramped rears in the segment. As I see it, this is one of the Ameo's biggest weaknesses. The 330-litre boot isn't as large as the Honda Amaze's 400 litres, but has a wide loading bay and a flat floor with minimal intrusions. It is generously spacious and a huge improvement over the Polo. For now, the Volkswagen Ameo is only available with the 1.2-litre three cylinder MPI petrol engine. 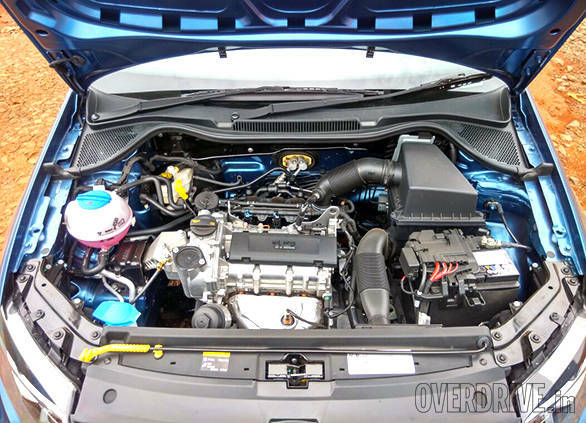 This makes it the only car in its segment with a three cylinder engine and power figures are modest at best - 75PS@5,400rpm and 110Nm@3,750rpm. Despite being the least powerful car on paper, the Ameo is not bad to drive. It's not fast, but not frustrating either. The engine is tractable at low speeds and in city, driving is quite pleasant. However, it tends to stall in reverse if you don't slip the clutch enough. On the highway, a downshift or two is necessary for a fast overtake but it can sit at an indicated 120kmph quite easily. The engine makes a typical three cylinder noise which does get interesting at high revs, but its performance is adequate at best. Since the Ameo only weighs 10-16kg heavier than the Polo model for model, it's fair to estimate similar levels of performance and efficiency. With an ARAI rated efficiency of 17.83kmpl, the Volkswagen Ameo along with the Honda Amaze is the least efficient of its rivals but we'll save the final judgement for when we test the car. Still, there's no doubt that the diesel engine will be far quicker and more involving. 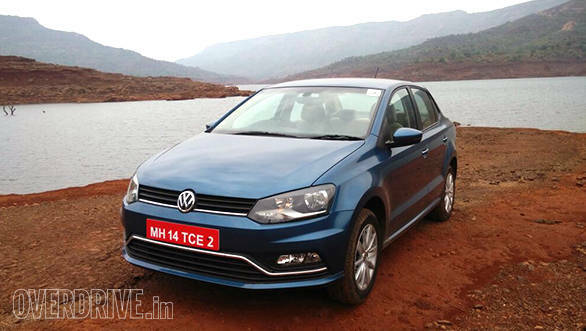 The diesel will arrive around Diwali with a choice of a five-speed manual and a 7-speed DSG. It will be worth the wait considering that this is the updated version of the 1.5-litre diesel and is expected to produce around 110PS. Even if your daily running isn't high enough, the extra power, efficiency and involvement of the diesel should make it worth the extra money. 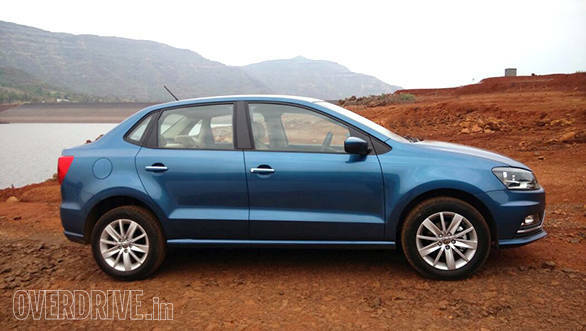 The Volkswagen Ameo runs on an unmodified version of the Polo chassis and like the engine, the suspension set-up has been untouched. This means you get a mix of good ride comfort and capable dynamics. The Ameo soaks up bumps well and is quite comfortable. Like the Polo, it tends to roll a bit in the corners but still generates good grip. Unlike the Polo, which comes with Apollo's great Alnac tyre, the Ameo runs MRF ZVTVs in the same 185/60 R15 size. Steering feel is good with a pleasant firmness at low speeds that builds progressively as you go faster. High speed composure is great and the Ameo has a confidence inspiring feel of solidity on the highway. Despite the low power figures, I quite enjoyed driving the Ameo, both in urban and highway settings. Having entered the segment so late and still reeling from the international emissions fiasco, Volkswagen needed something special to break into the segment. The Ameo is a great car, offering German engineering and quality with the best feature list in the segment. The fact that dual airbags and ABS are standard in every trim deserves extra applause. But all this isn't quite enough and Volkswagen knows they need more to woo the customer. And what woos better than an attractive price? Volkswagen has taken the unprecedented step of pricing the compact sedan cheaper than the hatchback it is based on. At Rs 5.14 to 6.91 lakh ex-Mumbai, not only is the Ameo up to Rs 40,000 less expensive than the Polo but is also priced lower than all its rivals save for the Tata Zest. This is fantastic pricing for a product from a brand that has traditionally commanded a premium. Will it work? Volkswagen has a lot riding on the fact that it will.